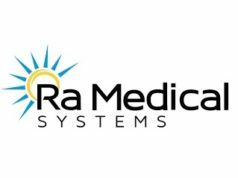 Ra Medical Systems and bo medical technologies, have announced the launch of the Dabra atherectomy system for cardiovascular and Pharos excimer laser for dermatology in Europe. Ra Medical says that its Pharos (FDA market cleared and CE mark) has more than a decade of success treating challenging, chronic dermatology diseases including psoriasis, vitiligo, and atopic dermatitis throughout the USA, Middle East, and Asia. The Dabra atherectomy system (CE mark and investigational in the USA), has a 95% success rate in clinical trials in North America. “bo medical technologies has extensive expertise and market presence in both dermatology and vascular markets in the Benelux Union as well as Scandinavia. They have outstanding relationships with thought leaders and high volume practitioners in both therapeutic areas, extensive technical experience, and the drive to capture the Northern European market for both Pharos and Dabra,” said Ra Medical Systems co-founder and chief executive officer Dean Irwin. “We see bo medical as the first of many successful partnerships as we penetrate the dermatology and vascular markets in Europe. We are actively looking for additional distribution partners throughout Europe as we drive Pharos’ and Dabra’s commercialisation in this region,” added Irwin. “Healthcare continues to evolve, with practitioners looking for newer, more cost-effective, safer, and better options than current treatments. Our laser and catheter systems offer alternative treatment options with potentially better outcomes and are now available in markets around the world. Giving patients access to these treatments for their diseases, often for the first time in their lives, is quite rewarding,” added Jeffrey Kraws, president.